Don't you just love shopping at a shopping mall? Personally speaking, I find this 'grand center of commerce' to be a very nice location to eat, buy stuff, sell stuff, and argue with your wife like you've never argued with her before. Or maybe that just me then? Me and Director: Paul Mazursky; plus Actors: Woody Allen, Bette Midler, and Bill Irwin. But only in 1991 and for 90-minutes. Give or take an hour or so. Alright, I know what you are thinking to yourself. How does Californian lawyer, Nick Fifer (Woody Allen), manage to upset his wife, Deborah (Bette Midler), on the eve of their fifteenth wedding anniversary? Does it have anything to do with their teenage children going away for the weekend? No. Not really. Although it does cost them quite a bit in the process! OK then, so is it associated with the party they're going to through later in the day to celebrate their loving union? No. It's has nothing to do with that at all. Mores the pity. Well, does it have anything to do with them going shopping together, and then exchanging expensive presents to rejoice his auspicious occasion? Nope again. Not one little bit. Though, I'm sorry to say, that Nick upsets Deborah by telling her that he's just broken up from an affair he's been having for the last couple of months with a much younger woman. Don't fret though. After they fight in the food-court. After they plan their divorce in a Mexican restaurant. And after they reconnect at a cinema. Deborah tells Nick that she's been having an affair as well. No. Not with the shopping mall's Mime (Bill Irwin). With Doctor Hans Clava (Paul Mazursky) instead! You know, the man that helped her write her successful book on marriage. Yes. This is one of those tales! One where Nick and Deborah's relationship is digested, manifested, and regurgitated for the sake of honesty, modesty, and for some focus on their future. But then again, I suppose that is most probably why what next transpires all comes to a head when this disgruntled duo shop till they drop. Literally. As views are aired - Nick is scared - Deborah looks smashing - and a partnership come across as rather pithy and dashing. In all honestly 'Scenes from a Mall' is one of those films' that has confused me quite a bit. On one level, the story is pretty solid, the actors are great, and the overall intent of the picture is very much apparent. Yet, in the same breath, the exposition like structure is very much like a yo-yo in nature -- up and down / up and down -- and I wasn't very comfortable seeing Woody as a laid back 'Californian every-man', with a rather hot / cold relationship with his spouse. Well, for years, Woody's screen persona has always been the 'New York neurotic', who mumbles and stutters his way in and out of trouble in that Woody Allen way of his. So to see him in this rather miscast role has dumbfounded me in hindsight; making me question myself more than I have questioned this movie. Straight up, I'm not the type of person who likes to see actors type-cast for the sake of continuity or familiarity. I like to see actors stretch themselves at times, allowing their talent to grow in both scope and style. Granted, here and there Woody was able to do just that -- because he did give his part a sort of recognizable edge that suited him in a disjoined way. Plus I suppose that I could also say the same thing about Bette Midler too. Although she was playing more 'to type', and had that 'sassy saunter' which really aided her relationship with Woody. However, in my eyes, the one unredeemable feature about 'Scenes from a Mall', was the format that it was presented in. It should not have been a movie set in an actual shopping mall. It's a stage play involving two characters trying to sort out their relationship! All these comings and goings with 'the Mime' and the other 'background artists' distracted from the central plot, giving the theme of this movie a rather overt tone that comes across in a very blaze manner. Take the scene where Woody tells Bette that he has had an affair for instance. If the camera only focused on there argument more than the reactions of the passers-by, then this segment would be more intimate and more revealing -- which is at the core of this flick. Instead, it was more embarrassing because the 'external hullabaloo', gave this scene a more acquired flavor which unfortunately distracted from the intent. Anyway, that's my general opinion. So before I disappear to never-never land, here, check out these filmic-facts, OK? (1) This picture was released by 'Touchstone Pictures' on the 22nd of February, 1991, and out of the $3 million dollar budget, it made $9,563,393 back at the box office. 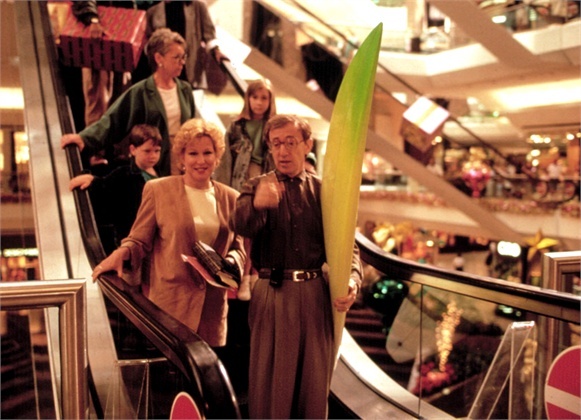 (2) Woody Allen stated that he has never visited a shopping mall prior to making this movie. (3) Bill Irwin's first acting job was on the 1961 television series 'Angel'. He played a coach. (4) Doctor Hans Clava is played by the director / co-writer of this film, Paul Mazursky. (5) The majority of this production was recorded on a multi-level sound stage in Queens, New York. But any scene which had an elevator or an escalator was captured at a 'real Mall' in Stanford, Connecticut. Plus the exteriors were shot in the 'Beverly Center Mall' located in Los Angeles. (6) This film references a number of other noted media sources during exposition. Such as the 1966 flick 'Blow-Up'; Woody's 1977 classic 'Annie Hall'; and the television series 'Scenes from a Marriage' too. Also, on the movie marquee you can see the printed names of 'Salaam Bombay! ', 'Rocky V', 'Predator 2' and 'The Godfather: Part III'. (7) Now there's a strange chain of coincidences were this flick is concerned. Bette Midler's film debut was as a passenger in the adventure movie 'Hawaii'. Max von Sydow was one of the leads in this production, and he starred in the Igmar Bergman classic 'The Seventh Seal' [click here for review]. And the title of this piece was taken from a play directed by Bergman, who is one of Woody Allen's most pronounced influences. Now is that a coincidence or what? (8) Paul's co-writer on this film, Roger L. Simon, also wrote the screenplay for the 1977 Richard Dreyfuss comedy 'The Big Fix'. Plus, on a side note, Bette co-starred with Richard and was directed by Paul five years previously on the comedy 'Down and Out in Beverly Hills'. 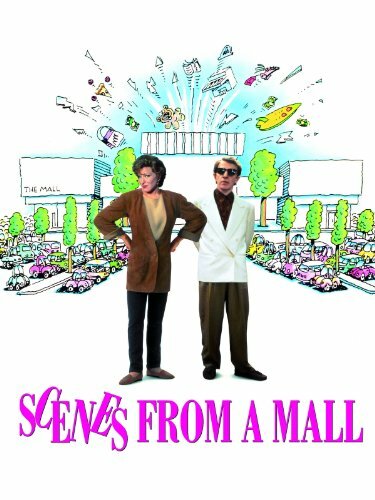 Overall 'Scenes from a Mall' is what I would call a so-so film. The story was solid. The acting was fair. And the presentation was of the flimflam variety. Nuff said.